Its October again which means halloween is just a few weeks away. Eco and halloween wouldn’t generally go in the same sentence especially when one considers some of the things that are burnt in bonfires. 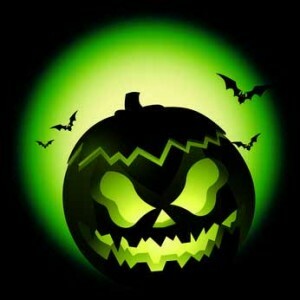 Despite this we have come up with a few tips on how to go green this halloween. Please add your own tips in the comment field below. We will give away prizes to the best three answers provided. 1: Because halloween costumes tend to be worn once and then thrown away its worth considering making your own costume from old materials and fabrics lying around the house instead of wasting money buying one. The best costumes are always your own ideas anyway. 3: For the trick or treaters give out organic or natural treats. If you got time you can always try making a pumpkin pie! 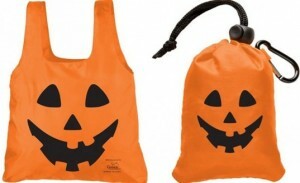 4: If a trick or treater use a reuseable bag to carry all the goodies. You can get customised one for halloween. Better still if you got old pillow cases lying around the house decorate them and use them as bags for the special ocassion. They can always be used again next year. 5: Stay safe when trick or treating with glow armbands, glow badges and a shake flashlight which require no batteries. If you can’t see yourself wearing your halloween costume again, consider swapping with a friend who doesn’t live near by, or donating to a charity shop. If you swap with a friend, you get a new costume for nothing. If you donate it to charity, you are helping out a good cause and will be satisfied knowing it didn’t get one wear and then thrown in the rubbish! Dressing up is not just for Halloween. My kids have a dress up box and dress up every day. 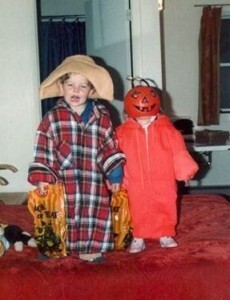 They choose one of their outfits in the box to go trick or treating. A charity shop is a terrific place to pick up Halloween Customes for next to nothing.Mix and match all you need is a little imagination. They can also be donated back to the Charity Shop when no longer useful. Its a win win for everyone. If you’re hollowing out a pumpkin to make a Jack O’ Lantern, don’t just chuck the pumpkin flesh in the bin; use it to make one of the many delicious sweet n’ savoury recipes that you can find on line. When you’re finished with your Jack O’ Lantern, again, don’t bin it, compost it! We all know fireworks are part of hallowenn even if they arent eco-friendly so a week or so before Halloween leave a few buckets out in the open in your garden. Lets face it, its gonna rain at some point and let the rainwater fill the buckets. So come the big night if your family or neighbours have fireworks pass them a bucket or two of rainwater to “dunk” the empty cartridges in. This ensures they are cooled right down and avoid the risk of a child picking them up or continuing to smolulder. It also means there is water near by just in case something goes wrong! Remember even the little one’s pretty sparklers get very hot so make sure they are dunked when finished. Ensure kids costumes are checked for flamable material. It only takes a sparkler to set it up in flames…..
Any buckets not used on the night??? Perfect for watering the new November flowers the next day!! Happy and safe halloween everyone! I give away stuff I no longer need and get things people are giving away. All for free. The RSA are giving away reflective vests at the moment. I got one at the ploughing . You don’t have to spend a fortune on costumes. Hi folks, i’m a big fan of eco friendly actions and deeds – we can’t do much about the state of our economy so at least we can try to improve our environment! One thing we can do is make sure the kids use recyclable bags or containers or even pillowcases when they head off trick or treating. Then try to get the kids to keep all their wrappers in their bag til they get home – give a reward for whoever returns with the most wrappers. If you’re going along with them, you could always bring a bag yourself to pick up rubbish around the neighbourhood – if you’re feeling generous!! you’d be surprised how much litter is left around estates and the city at Halloween. It’s art ideas time. Whatever happened to the crepe paper we used to make so much with when we were in school. Lots of crazy outfits can be put together using re-cycled crepe paper, glue, plenty diy entertainment for kids. Happy Halloween. If making lanterns out of pumpkins these are great for composting. The compost can be used as fertilizer for your garden. Don’t forget to switch off your lights with the lanterns on and save some electricity!! The worst waste of energy ever has to be the loss of heat from the house by opening and closing the front door countless times to ‘trick-or-treat’ers. Last year I bundled the kids up nice and warm in their halloween costumes and set up a table outside the front door with pumpkin candles and our halloween treats to hand out to the kids. Our house was very popular as it was like a sweet stall & the kids really enjoyed the thrill of being outside in the dark. The bonus being that the house was nice and warm when we were finished. spend time together making your own costumes. Make them from black refuse sacks and stick lots of bits and bobs on them to make them scary. Use an ordinary plastic bag for trick or treating – you don’t have to use a custom made fancy container for it. Learn a trick to use at the doors. It really adds to the fun of the night if you can do a trick as opposed to just collecting sweets. I am a bit of a green fingers in the garden but at this time of year most of the vegetables have past their sell by dates and its time to clear out all the old stock. My kids love to use the remaining snail invested cabbages and lettuces to decorate the front of the house for Halloween! They love to spook out the trick or treaters with real live snails and caterpillars!! (Don’t worry they don’t get hurt and all end up in the compost heap the next day!!). Don’t go buying any costumes, all decorations can be made from recycled materials. We always have great fun at halloween decorating our house. We make scary people using a sweeping brush as the body, a big old jacket, masks made from papier machée (using old newspapers), big old shoes (that are actually now used as flower pots but they hide under the jacket), and hats. We hide them in the front yard and use old balls of cotton wool to weave spider webs around them. Hang pieces of broken crockery/glass/metals from the trees so that when the wind blows they clatter together. Use the inside of the pumpkin to make yummy pumpkin soup or bread, and when the carved pumpkin is finished with, compost it. A huge amount of packaging is wasted on all the treats to give to the kids. We make a load of popcorn and put it into pouches that we make from paper and we bake cakes and slice them up etc. Leave as many light off as possible, makes it scarier anyway! Instead of buying the tacky light up halloween decorations, spend some family time together hollowing out a pumpkin (the inside of which can be used to make pumpkin pies, pumpkin seed flapjacks, and many other healthy halloween treats). Then put candles inside the pumpkin instead to reduce the electricity usage. Using candles as decorations also helps to heat the place up, you’d be surprised at how much heat a tea light can give out! They also help to create an eerie atmosphere. The pumpkins can be composted after halloween, while regular, shop bought decorations can often take up a lot of storage space! I’m always eco Friendly at Halloween. My husband always goes as a ghost old sheet and keep them up for next year. And I always go as a bag of Rubbish or a cereal killer. Black bag with rubbish attached to it and a black coal face or a black bag with old cereal carton’s on it with a fake knife and fake blood made from ketchup. All the rubbish and cereal cartons can be recycled. With my pumpkin I make a pumpkin pie out of the flesh and dispose the rest of it in my brown bin . My Son is only 1 but when he is old enough to go around trick or treating I will make his costume from scratch. When the kids come knocking for the tricks and treats, make sure you have some good treats to offer. Consider making your own fudge, candy apples, baked pumpkin seeds, etc. Autumn is a great time to use natural things for decoration. From fallen leaves to pumpkins, use whatever you can find in nature to decorate your home. My kids love to use whatever we have around the house including playsilks! Having 3 lil men trying to instill good character is sometimes work. But for holidays working days in advance at the local food banks makes my boys realize how much they really have. Giving everyday,helping, and of course having fun is all part of growing, harvesting a good character. For Halloween we still make our costumes out of fabric fr. the thrift stores,but our hearts are full of spirit for goodwill and spreading love. WHAT ARE YOU HARVESTING THIS FALL? 2. Instead of buying a Halloween costume that you or your children will wear once and throw away, make your own costumes from old clothes and other items you already have around the house. 3. Give out eco-friendly candy. 5. If you are attending a Halloween party, use public transportation or ride your bicycle. 6. If traveling by car is really the only way to join in Halloween fun with your family or friends, try carpooling. REDUCE wasting leftovers: after carving your pumkin, take the seeds off the flesh and roast them, then lightly salt -yummy delish! REUSE: halloween deco’s are generally the same every year, reuse them! you can also make some unique originals out of almost anything! RECYCLE old clothing: making your own costumes out of old clothing and odds and ends, is way more fun and you will always have a unique one! make ur own decorations instead of buyin………….eg tissues and cotton wool for ghouts ..bats can be made from toilet rolls..and painted black these can be used evry year……..lets go back to the traditional giving,,of fruit and nuts saves on the wrappers been thrown out,,,,,,,,,,,i think another lovely idea for hallowen bags is paint a brown paper bags black.get creative spend quality time with your kids making costumes from old clothes,,,,,,,,,,,,,,,,,,,,,,happy halloween!! On Halloween night scare the S**t outta someone and take all their toilet paper away! Thank you all for your contribution and keep an eye out for the November competition.